This afternoon, more or less every basketball reporter simultaneously reported that Kawhi Leonard wanted out of San Antonio. The coordination of reports from Jabari Young, Chris Haynes, and Shams Charania suggests that the “league sources” behind this know what they’re talking about, and want everyone else to know it too. Per Woj, Kawhi wants to go back home to Los Angeles. Gregg Popovich and Tim Duncan reportedly met with Leonard in New York on Thursday in an attempt to convince him to come back to San Antonio for the final year of his contract. 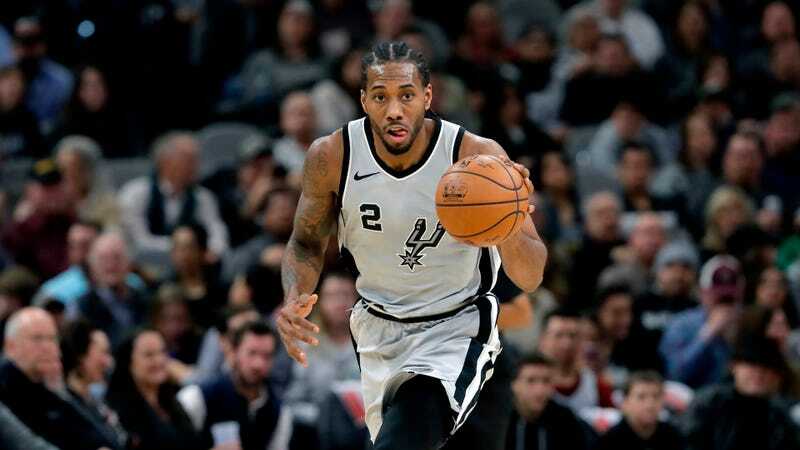 The Spurs don’t exactly have a ton of leverage in trade negotiations, since Leonard has made his preferred destination known and has already displayed his willingness to sit out, playing in only nine games last season as he battled a mysterious injury. Leonard spent most of the second half of the season in New York working with his own doctors even after the Spurs cleared him to play. His teammates expressed their frustration with him several times, but he didn’t return after a January stint and sat out the Spurs ‘playoff loss to the Warriors. The Lakers look like they’re in for a big summer, with Leonard wanting to join the team right as Paul George and a certain Cavalier hit free agency. Under normal circumstances, the price for Leonard would be prohibitively steep—probably something like Kyle Kuzma, Lonzo Ball, and a pick—though given his injury and the fact that he’s already sat out a season, the Lakers would probably be able to get Leonard for relatively cheap. All that remains to be seen is who else they can surround him with this offseason.